I've had a complicated relationship with singleness for, well, all of my adult life. There is the singleness itself, and all of its complexities and emotions, but bigger than the singleness is a deep sense that life has not gone according to my plan, and I can’t figure out God’s reason for that. While this has played itself out most starkly in my life in the area of singleness, at its core, it’s a tension we all feel—all has not gone as we thought it would in our lives, and we’re not sure why. Sometimes surprises turn out better than we had hoped or dreamed, but often we feel the unplanned nature of our lives most acutely when what we wanted to be good turned out otherwise. It’s tempting to think if we work hard and do all the right things we may be able to get ourselves where we want to be, and in certain situations, that may be true. But it’s certainly not always true. Then we have to face down what we really believe about God, and ask ourselves, how do we honor God well wherever we are? How do we honor God in the city we live in, the relationships (romantic or otherwise) we’re a part of, the workplace we go to—even if we didn’t expect or hope to be there? I’m still figuring out how to do this well in my singleness. Being unmarried and childless at nearly 28 was definitely not what I expected for my life, and yet I find myself here, gainfully employed, a homeowner, deeply grateful for the wonderful family and friends I have, and trying to steward what I have been given for the glory of God—all while trying to remain deeply hopeful that someday (preferably soon) my deep desire for a husband and children will be fulfilled. For me, at this point in life, it’s singleness that makes me question God’s goodness. But it may also be illness, or divorce, or childlessness, or homelessness, or so many other things. We are so quick to say “I’m blessed” when thing are working out the way we want them to, but what we often fail to recognize is that we are no less blessed when things are difficult than when they are easy. God never promised he would give us everything we’ve ever wanted simply because we want it; he’s promised to be with us whether we get those things or not. For decades I wanted to marry and have kids, but I reached menopause and still there were no husband, let alone kids in the picture. Now I'm 59, and I'm no longer anxious about that. I also hoped to have a career of my own and be financially independent, but at 28 I started having symptoms of schizophrenia that were diagnosed ten years later, so after I graduated with my second B.A., I had to go on Welfare because I couldn't find an employer who would hire me. 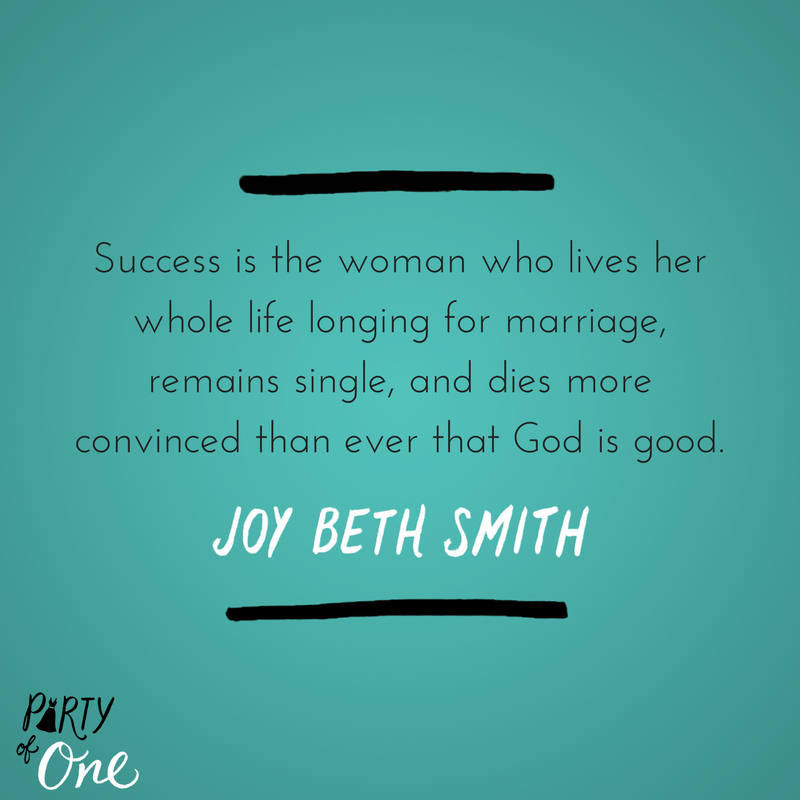 I have sort of come to terms about my singleness, but right now, I CAN'T say that I feel successful, if success is longing for marriage all your life, not getting it, but still dying more convinced than ever that God is good. Maybe because I'm having a hard time feeling that God is good right now. I'm pissed off with him. For months I prayed that he would help me with a financial problem, a debt, and nothing happened. So much so that I ended up thinking the institution I owed the money to had decided to write the debt off as a loss. And now after months of silence, out of the blue, here they come again demanding payment of $7,000. by the end of April as though I'm going to get that out of thin air. In the meantime my situation hasn't changed significantly in that I'm living on disability income instead of welfare, but I'm not getting nearly enough money to come up with $7,000 by the end of the month. I don't know where to look for it. I tried lottery tickets, but nothing came off that. So now I don't know what to do anymore. I'm sympathetic to your financial dilemma I would encourage you not to "shake your fist at God", as it were, but rather look around for how God may yet provide for you. It seems to me that it would be entirely appropriate for you to speak with the deacons of your church concerning your dilemma, for they are God's ministers of mercy to you. They may be able to help with some combination of benevolent giving and budgeting help to provide for eventually retiring this burden completely. Oftentimes in the Christian life God does not intervene or provide in miraculous supernatural ways, but through very ordinary means such as the love and care of the body of Christ. May you be blessed in this way through your local church body, and may you again be encouraged in the loving provision of your Heavenly Father.